Üretim veya satın alma kararı, işletmenin üretim sürecini, mamul karmasını ve işletmenin kârlılığını etkilemektedir. En uygun üretim veya satın alma kararının verilmesinde klasik olarak maliyet tabanlı analiz yapılmaktadır. Üretim veya satın alma kararının tam zamanında verilmesi gerekmektedir. İşletmeler, kısıtlayıcıların var olduğu bir ortamda faaliyet göstermektedir. Kısıtlar Teorisine (KT) göre, işletmenin kârını artırmak amacı ile kısıtların etkin bir şekilde yönetilmesi gerekmektedir. KT’ de, üretim veya satın alma kararı verilirken maliyet tabanlı analiz yerine kısıt süresi başına katkı payını esas alan bir analiz yapılmaktadır. Bu çalışmada, üretim veya satın alma kararının verilmesi ile ilgili olarak klasik maliyet analizi ve KT karşılaştırmalı olarak incelenmektedir. Atkinson, Anthony A., Kaplan, Robert S. ve Young, Mark S. (2004), “Management Accounting”, 4th. Ed., Pearson-Prentice Hall. Atwater, B. ve Gagne, M.L. (1997), “The Theory of Constraints Versus Contribution Margin Analysis For Product Mix Decisions” Journal of Cost Management, (January/February), ss.6–15. Balakrishnan, Jaydeep ve Cheng, Chun H. (2005), “The Theory of Constraints and The Make-or-Buy Decision: An Update and Review”, The Journal of Supply Chain Management, 41(1), ss. 40–47. Baxendale, Sidney ve Gupta, Mahesh (1998), “Aligning TOC&ABC For Silkscreen Printing”, Management Accounting, (April), ss. 39–44. Blackstone, John H. (2001), “Theory of Constraints-A Status Report”, International Journal of Production Research, 39(6), ss. 1053– 1080. Blocher, Edward J., Chen, Kung H. ve Lin, Thomas W. (2002), “Cost Management: A Strategic Emphasis”, (McGraw-Hill, 2nd ed.). Corbett, Thomas (1998), “Througput Accounting”, (The North River Press). Corbett, Thomas (2000), “Througput Accounting and Activity-Based Costing: The Driving Factors Behind Each Methodology”, Journal of Cost Management, (January/February), ss. 37–45. Demmy, Steve ve Talbott, John (1998), “Improve Internal Reporting With ABC and TOC”, Management Accounting, 80(5), 18–24. Gardiner, Stanley C. ve Blackstone, John H. (1991), “The Theory of Constraints and The Make-or-Buy Decision”, International Journal of Purchasing and Material Management, 27(3), ss. 38–43. Garrison, Ray H. ve Noreen, Eric W. (2003), “Managerial Accounting”, 10th. Ed., McGraw-Hill. Goldratt, Eliyahu M. (1990), “The Haystack Syndrome: Shifting Information Out of the Data Ocean” (The North River Press). Goldratt, Eliyahu M. ve Cox Jeff (2004), “The Goal: A Process of Ongoing Improvement”, (North River Pres, 3th. Ed.). Gupta, Mahesh (2003), “Constraints Management-Recent Advances and Practices”, International Journal of Production Research, 41(4) ss. 647–569. Harrigan, Kathryn R. (1985), “Vertical Integration and Corporate Strategy”, Academy of Management Journal, 28(2), ss. 397–425. Huang, L. (1999), “The Integration of Activity –Based Costing and the Theory of Constraints”, Journal of Cost Management, (November/ December), ss. 21-27. IMA (1999), “Theory of Constraints (TOC) Management System Fundementals”, Statement on Management Accounting, Statement No:4HH. (IMA:Institute of Management Accountants). Kershaw, Russ (2000), “The Theory of Constraints: Strategic Implications For Product Pricing Decisions”, Journal of Cost Management, January/February, ss. 4–11. Lazol, İbrahim (2004), “Maliyet Muhasebesi”, Ekin Kitapevi, 2. Baskı, Bursa. Mclvor, R. T., Humphreys, P.K, ve Mcleer, W.E. (1997), “A Strategic Model for The Formulation of Effective Make or Buy Decision”, Management Decision, 35(2), ss. 169–178. Murphy, Robert E. ve Dedera, Christopher R. (1996), “Holistic TOC For Maximum Profitability”, IEEE/SEMI Advanced Semiconductor Manufacturing Performance, ss. 242–249. Park Hong Y., Reddy, Surrender C. ve Sarkar, Sam (2000), “Make or Buy Strategy in the U.S.”, Multinational Business Review, 8(2), ss. 89– 97. Peker, Alparslan (1988), “Modern Yönetim Muhasebesi”,.4. Baskı, İstanbul Üniversitesi Muhasebe Enstitüsü Vakfı Yayınları, Yayın No: 53, İstanbul. Sheu, Chwen, Chen,Ming H. ve Kovar, Stacy (2003), “Integrating ABC and TOC for Better Manufacturing Decision Making”, Integrated Manufacturins Systems, (Vol.14,No.5):433-441. Sislian, Eric ve Satir, Ahmet (2000), “Strategic Sourcing: A Framework and a Case Study” The Journal of Supply Chain Management, 36(3), ss. 4–11. Smith, Malcolm (1997), “Bottleneck Management”, Charter, Accounting and Tax Periodicals, 68(3), ss. 32–34. Stein, Robert E. (1997), “Theory of Constraints Applications in Quality and Manufacturing”, (Marcel Dekker, 2nd.ed.). Taylor, Lloyd J., Nunley, A.M. ve Flock, Melvin D. (2004), “WIP Inventory: Assets or Liability”, Cost Engineering, 46(8), ss. 19–25. Tollington,Tony (1998), “ABC v TOC: “Same Cloth As Absorption v Marginal, Different Style and Cut?”, Management Accounting, 76(4), ss. 44– 45. ISNAD Kaygusuz, Sait Y. . "ÜRETİM VEYA SATIN ALMA KARARLARINDA KISITLAR TEORİSİ VE MS EXCEL OFFICE PROGRAMININ BİRLİKTE KULLANILMASI". 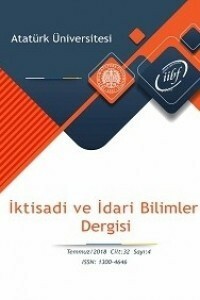 Atatürk Üniversitesi İktisadi ve İdari Bilimler Dergisi 20 / 2 (November 2010): 159-177.